This is it. 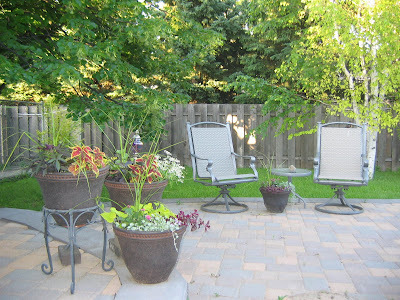 This is the view I enjoy as I sit on my patio and knit. 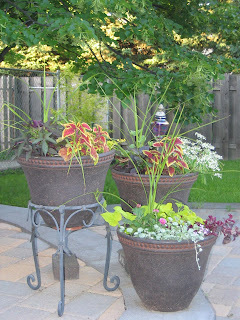 I took this picture on a perfect day while I sat in one chair with my feet up on another, knitting! Oh, the joy. The bliss. However, mother nature has been cranky this year, and most of my summer knitting has taken place in the house, which is just plain wrong. Tomorrow, the weatherman promises, will be lovely, and I'm holding him to it. I'm spending the early afternoon with my mom, and after that, it's outdoor knitting! I was visiting Cass' blog earlier, and couldn't help but smile at the pictures of her dog invading her knitting. I, too, have a dog who is showing signs of wanting to take up the craft. She's taken on three projects in the past three weeks: a skein of Noro Kureon, a ball of some funky eyelash stuff (I won't miss that one! ), and a ball of Classic Elite Paintbox! Yup, that's my Jayda. The sweet-faced, innocent looking one on the left. What to do?? How can I chastise her for a fascination with yarn? Well, the bag for my ITE IV partner is finished. And, if I do say so myself, it turned out great. My friends who have seen it strongly approve, and marvel at my strength of character in being able to send it away. And to a total stranger, no less! Truth is, I can hardly wait. This is my first bag exchange, and I've had so much fun. Now I've got a few other "goodies" to finish up and put together, and then it's off to the Post Office for me! 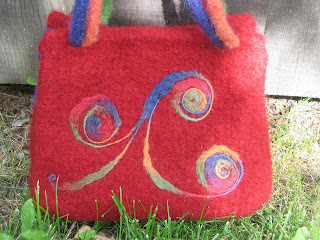 The needle felting was SO fun, and I love the way it turned out. I will most definately be doing more of that. I'm warming up for the Dog Days of Summer Dishcloth Exchange. I made this one out of Classic Elite Provence. I suppose it could be considered a little spendy for dishcloths ($12.95 a hank) , but I found some on a good sale, and figured that was reason enough to give it a try. It feels nice, and blocked up quickly. The diamond design was fun to do!! Both the mailman and the UPS guy were good to me today. First, Mr. Mailman brought a small package from Yarn Country containing three balls of beautiful variegated yarn and a pair of teal purse handles for a Noni bag I'm finishing, AND an ebay purchase of 5 hanks of hand dyed 100% cotton yarn. It is absolute eye candy. And though I don't know how hand dyed cotton will hold up for dishcloths, I most certainly plan to give it a try. Then, as if that weren't enough Mr. UPS stopped by with a box of purse handles that a friend and I ordered. I wonder . . . . . . will there be a package from WEBS tomorrow?????? OH - where to begin - your back yard is beautiful and I would be spending every available moment out there...Hope you had luck today in doing so. 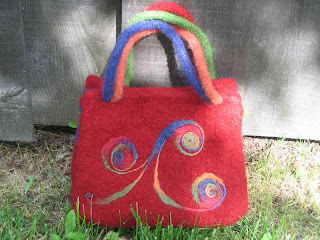 Your purse/tote/bag is gorgeous. What exactly is "needle felting"? I didn't check back to confirm what it's called - so hope I am not embarrassing myself. 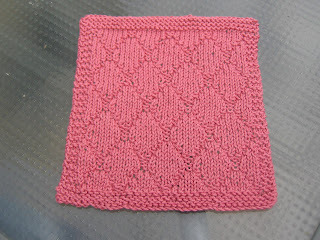 And..Love the dishcloth - what a great pattern. Awesome. I'm late to the party, but loving your bag just the same! !